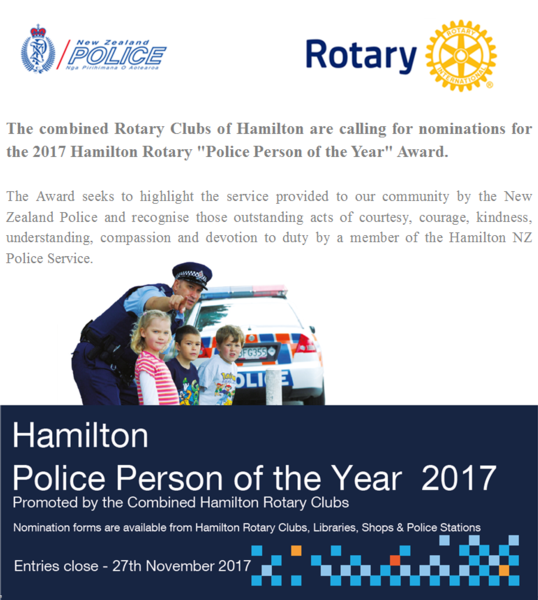 The combined Rotary Clubs of Hamilton are calling for nominations for the 2017 Hamilton Rotary "Police Person of the Year" Award. The Award seeks to highlight the service provided to our community by the New Zealand Police and recognises those outstanding acts of courtesy, courage, kindness, understanding, compassion and devotion to duty by a member of the Hamilton NZ Police Service. Each year's winner is chosen by a judging panel from nominations received from members of the public and groups in the community. This prestigious award is presented at the annual Police Pay Parade which is held each year in the Hamilton Gardens. Each October nominations for the Police Person of the Year Award are called for in advertisements throughout the Hamilton area using the local press, notices posted in police stations and libraries, and in posters displayed by shopkeepers and businesses throughout the City. The high quality and number of nominations received each year clearly demonstrates the high regard that the community holds for the members of the NZ Police and the importance that Hamiltonians place on the Rotary Police Person of the Year Award. The award aims to recognise an outstanding member of the NZ Police, from the rank of Constable to Senior Sergeant and may include support and voluntary staff of equivalent status. Those nominated must display consistent excellence and dedication to duty in their everyday work that reflects the high ideals of the NZ Police, and which is above and beyond their normal duties without thought of recognition or reward. This is consistent with the Rotary motto of “SERVICE ABOVE SELF". Nominations commence on Monday 16th October and close at 5pm on Monday 27th November. (Or at other such dates as agreed by the Selection Committee).